In this article, we will examine surgical and non-surgical options for the patient with recurrent patellar instability or kneecap dislocation. Kneecap dislocation occurs when there is an impact injury to the knee significant enough to dislodge the kneecap. When this injury occurs there can be damage or complete disintegration of the medial patellofemoral ligament (MPFL) and medial patellotibial ligament (MPTL). When there is the complete destruction of the ligament(s), the patient will then decide if they will have a medial patellofemoral ligament and/or medial patellofemoral ligament and medial patellotibial ligament reconstruction surgery. Surgery for a completely disintegrated ligament that occurs with acute injury and dislocation. What we are going to look at first is the injury that occurs when the knee suffers a blow that knocks the kneecap out of its groove. When this injury occurs almost always the medial patellofemoral ligament is completely ruptured. Ligaments connect bones to bones. 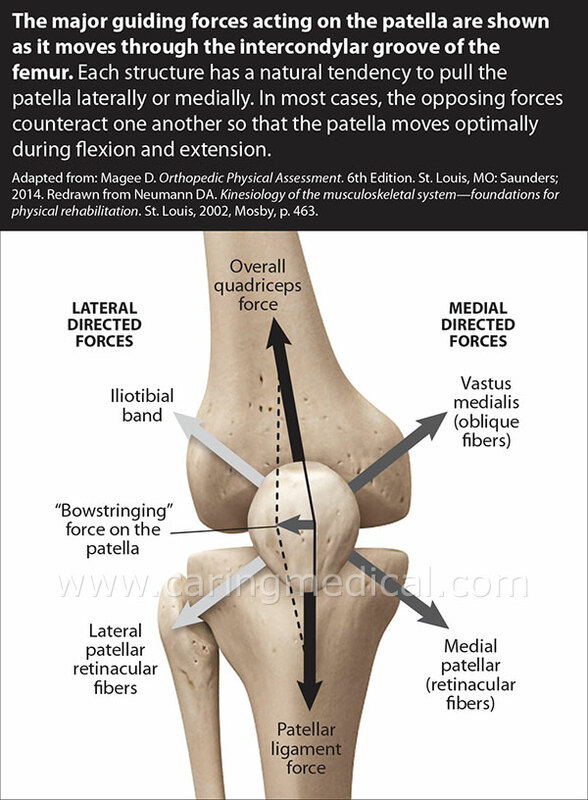 The medial patellofemoral ligament connects the lower thigh bone to the back of the patella/kneecap. So it is easy to see when the kneecap is dislocated, this attachment snaps. At this point, a decision must be made on treatment. First, we will look at the surgical treatment. The first treatment decision is obviously to get the kneecap back in place and secure it. Your doctor may recommend surgery to repair or reconstruct the medial patellofemoral ligament. He/she will refer to it as your MPFL. If this is your first kneecap dislocation, the decision to go to surgery will come with a degree of urgency. Surgeons believe that they only get one chance to perform a repair to your original ligament. After repeated dislocations, the original ligament cannot be surgically repaired, It must be reconstructed from a tendon or ligament that the surgeons get from somewhere else in your body. If the ligament suffers a total rupture/disintegration – then the surgery is not repair, but reconstruction. These surgeries have been shown that they do not decrease future dislocation risk. (This is something we will discuss below, isolated repair cannot guarantee future knee stability). In patients with acute patellar dislocation, there were no significant differences in all evaluated outcomes between the conservative and surgical treatment groups. For patients with recurrent patellar dislocation, MPFL reconstruction was associated with better outcome scores than compared with soft tissue realignment surgery. MPFL reconstruction is associated with more favorable clinical outcomes compared with medial soft tissue realignment surgery in patients with recurrent patellar dislocation. MPFL reconstruction is the better of surgical treatment strategies, once the patient decides that they want the surgery anyway. The bottom line: Surgeons are reporting to surgeons that non-surgical technique is in fact just as good as surgery. Now we are going to get into even more controversy surrounding the treatment of a patella dislocation. The conservative non-surgical treatment option. This is not to be confused with the non-surgical regenerative medicine option we will discuss below. Immobilization in extension (your knee is fixed in a straight leg position) may give the MPFL better environment in which to heal. However, this comes at the expense of stiffness, weakness, and loss of limb and proximal control that often accompany prolonged immobilization. Patient compliance can also be a factor in deciding nonoperative treatment. For these reasons, many clinicians advocate a short period of immobilization, followed by rehabilitation of the knee, with or without a patellar brace. Although the management of the primary patellar dislocation remains a topic of considerable controversy, certain conclusions can be drawn. If a hemarthrosis (bleeding in the knee) is present, patients should be evaluated for osteochondral fractures (damaged to the cartilage and bone underneath). Acute surgical stabilization remains controversial, with no clear long-term benefits demonstrated in the literature. If nonoperative management is elected, a period of immobilization in extension up to 6 weeks will yield the lowest redislocation rate. In sum, this algorithm provides an evidence-based approach that assists the clinician in the treatment of the acute first-time patellar dislocation. There is currently no consensus regarding the optimal surgical treatment method for patients with recurrent patellar instability. (Chronic patella dislocation). The average age of the patients at the time of surgery was 16 and comprised of adolescent athletes. The youngest patient in the study was 9. The patients were followed for about 5 – 15 years post surgery. Pain continued post surgery: Residual complaints were present in 34 cases (79%). Dislocation continued post surgery: Twenty-two cases had recurrent dislocation after a median interval of 30 months. The probability of recurrent dislocations amounted to 16% after 1 year and 52% after 10 years. Surgery judged ineffective: The combined arthroscopic lateral release with medial reefing does not appear to be an adequate treatment for patients with chronic patellar instability in long-term follow-up. Why Do Patellofemoral Stabilization Procedures Fail? Doctors in the United Kingdom said it more simply in their March 2017 paper published in the Sports medicine and arthroscopy review. They asked Why do patellofemoral stabilization procedures fail? Patellofemoral instability surgery success rates? Doctors note that many treatments can make symptoms of patellofemoral instability and pain worse in some patients. One paper says more than 25% of patients had significant side effects after surgical treatment of patellofemoral instability. Some cases of patellofemoral instability are difficult to manage and, in fact, some treatments can make the patient feel worse. Frequently, the patient often bounces from practitioner to practitioner, physiotherapist to surgeon, seeking some relief of symptoms. However, their underlying source of pain is not well understood, so treatment can aggravate the symptoms. This supports research from the Mayo Clinic published in the American Journal of Sports Medicine that says when you have multiple knee ligament damages – such as in degenerative wear and tear or acute injury – the medial patellofemoral ligament plays a very insignificant role in knee instability and does not even need to be addressed. (8) Of course to a doctor experienced in regenerating ligaments, all ligaments play an important role. In surgery, many times supportive tissue is discarded. Athletes with pain often feel there is no other choice but surgical procedures, even drastic ones. A good example of drastic surgery is the recommendation to surgically remove the patella in order to remove the pain. This sometimes does relieve the pain, but at a significant cost to the body. The strength to extend the knee is reduced by about 30 percent, and the force exerted in the knee is increased. There are a host of other risks associated with surgery. The patient must realize that with each procedure and each shaving or cutting of tissue, NSAID (non-steroidal anti-inflammatory drug) prescription, or cortisone shot, the odds of developing long-term arthritis are greatly increased. The key to keeping the knee strong is to stimulate the area to heal, not to cover up the pain with a cortisone shot or NSAID. Even worse is to eliminate the painful area by shaving or cutting. This just delays the pain for a few years until the remaining tissue becomes degenerated. The best approach for the athlete is to stimulate the area to heal. The regenerative medicine option. Prolotherapy injections to pull the kneecap into place and keep it there. In the research above you see that a first-time dislocation of the kneecap creates short and long-term problems of knee instability which leads to long-term problems of chronic patella subluxation or simply, chronic dislocation of the kneecap. This is also referred to as patellofemoral tracking syndrome. This is where the kneecap floats out of the groove on the femur (thigh bone) it is supposed to sit and glide up and down on. As we have seen in the research above, this can equally effect an adolescent athlete as well as an older athlete. The kneecap is supposed to stay in the middle of the knee, in its groove. But because of past dislocations or advanced knee instability, the kneecap wanders to the sides. When this occurs not only is there a problem of the maltracking patella, there is also a problem of accelerated wear and tear and the development of osteoarthritis. This can also lead to a problem of Patellofemoral Pain Syndrome. Prolotherapy injections stabilize the unstable knee and regenerates damaged tissue.